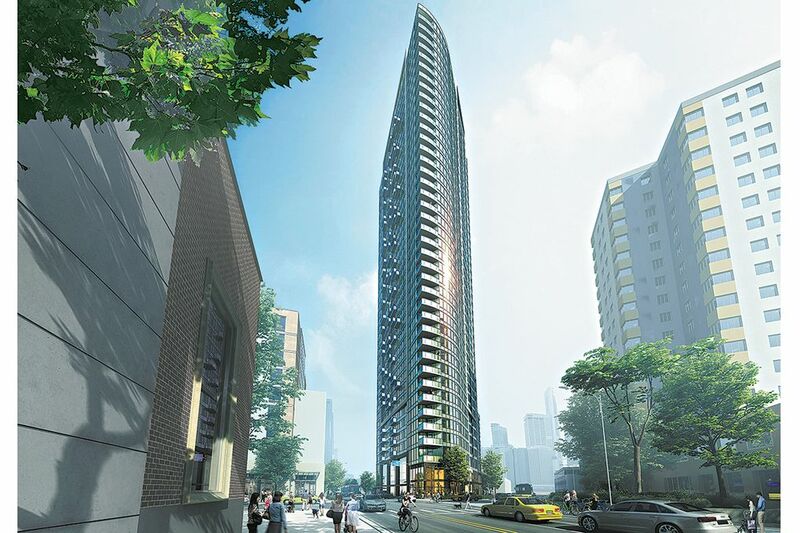 SPIRE has broken ground on a triangular tract at 600 Wall St. in Seattle’s Belltown neighborhood. The top floors will feature a wraparound rooftop terrace. A groundbreaking event took place recently at the site of the 40-story high-rise SPIRE, and a sales center is under construction. Public sales begin this fall. 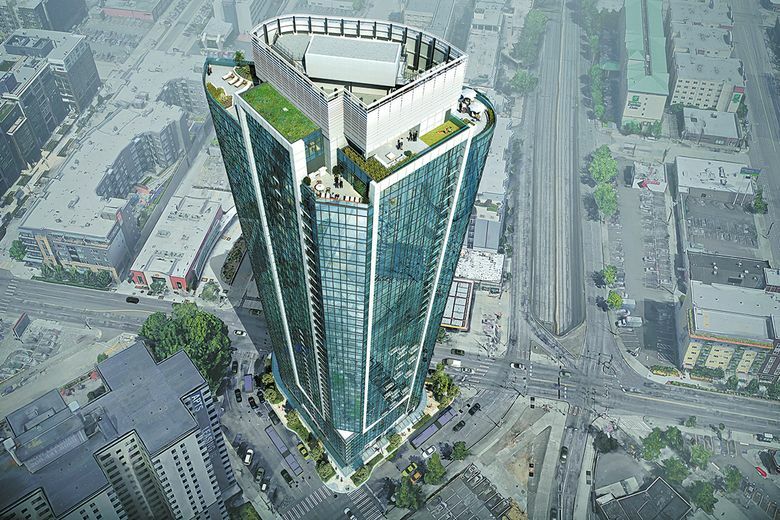 SEATTLE — More than 500 prospective buyers have registered for priority sales information at SPIRE, a 40-story condominium high-rise set to open in 2020 near the Space Needle. A groundbreaking event took place recently at the site — a triangular tract at 600 Wall St. — and the sales center is under construction. Public sales begin this fall. 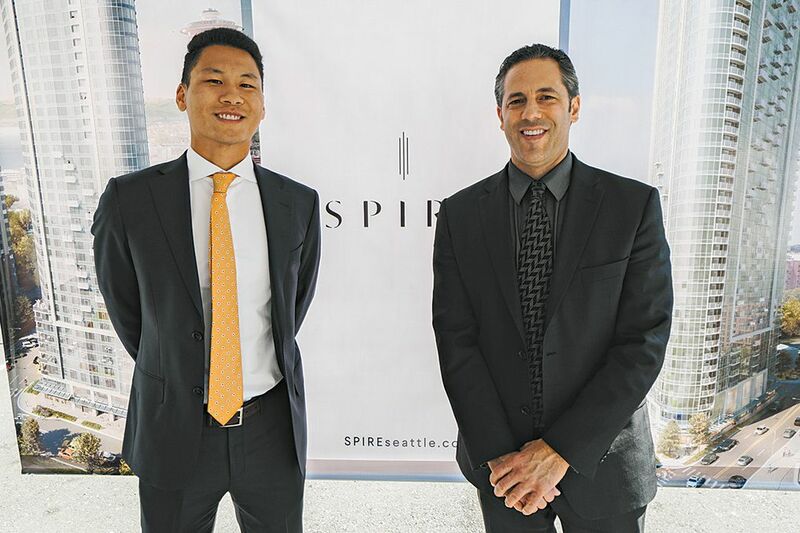 The SPIRE sales team includes Dehlan Gwo (left) and Michael Cannon. One of the more pivotal recent design decisions, he says, was to eliminate a residential floor in order to raise ceiling heights in all remaining levels. Nine-foot-clear ceiling heights are now planned on levels 4 through 23, 9.5-foot heights on levels 24 through 37, and 10-foot heights on the two penthouse floors (levels 38 and 39). Menzies says expansive window walls will allow ample natural light, while the unique triangular architecture will offer broad views of downtown Seattle’s skyline, South Lake Union and the Space Needle against a backdrop of Elliott Bay and the Olympic Mountains. Michael Cannon and Dehlan Gwo, brokers with Realogics Sotheby’s International Realty, have joined the SPIRE sales team. Cannon will serve as senior sales director, and Gwo will be the international sales director. Urban-one-bedrooms and one-bedrooms. They range in size from 531 to 776 square feet and are priced from the mid-$400,000s to more than $800,000. One-bedrooms. They range in size from 671 to 776 square feet and are priced from the $600,000s to more than $1 million. One-bedrooms, one-bedroom-plus-dens and two-bedrooms. They range in size from 823 to 1,986 square feet and are priced from the $800,000s to more than $3.3 million. Two- and three-bedrooms and three-bedroom-plus-dens. They range in size from 1,178 to more than 2,800 square feet and are priced from the low $1.4 millions to more than $5 million. Parking is included for some homes, while others offer optional parking for an additional $75,000; see agent for details.